At Serenity, our Passionate and dedicated team take our Social Responsibility seriously, which is why we make special effort to `give back` to the local Rawai Community. Members of Serenity Staff and guests of Serenity Resort & Residences, donate new School Uniforms for the children at the Watsawang Arrom School in Rawai. The 'Phuket has been good to us' foundation, with the support of an auction item from Serenity Resort and Residences Phuket, was able to raise over 474,000 Baht at the recent Burns Supper event, which will fund an English Teacher for a year. Serenity Resort & Residences donated 100 gift sets for the children at Watsawangarom School in Rawai on the occasion of the National children's day on 12 January 2012. The team of Serenity Resort & Residences Phuket led by Financial Controller Ms. Tang (third from left) and Human Resources Manager Ms. Mook (far right) recently donated bicycles for underprivileged children of the local Rawai community. The donation was received by a local representative of the village. Staff and guests of Serenity Resort & Residences, together with our GM, Mr. Urs Aebi, sponsor new School Uniforms for children at the Watsawang Arrom School in Rawai. Serenity's General Manager, Urs Aebi and a team of golfers including well known professional Scott Barr of Australia took part in Phuket's inaugural Pro Am Invitational at Blue Canyon to support the Phuket Has Been Good To Us Foundation. 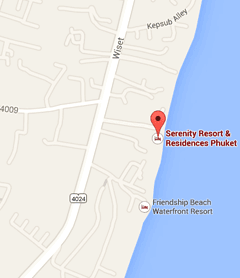 Serenity acted as a hole and accommodation sponsor in the event, which raised more than Baht 500,000 for the charity.